The Wall is the continuation of the Zionist/Israeli expansionist agenda of stealing Palestinian land and forcibly expelling residents, the Wall’s path annexes nearly 50% of the West Bank and almost all of the Israeli settlements. It is entirely unacceptable to build the Wall on the 1967 Green Line, there is a fundamental injustice in caging in an entire population. While the 1967 Green Line is advocated by the UN and many others to be the “international border” between Israel and the West Bank, the fact is that, following the 1948 war and the Zionist proclamation of the State of Israel, communities were forcibly and artificially divided into east/west by this “border”. However, the residents continue to share social services, markets, and familiar ties. To advocate that the Wall could be built on the 1967 Green Line is to legitimize the forcible separation of these communities. Around Jerusalem the Wall is completing the Zionist/Israeli project of “Greater Jerusalem”, which aims at “judaizing” and annexing East Jerusalem into a Jewish metropolitan area. The Wall closes Jerusalem off to the north and south of the West Bank, but remains “open” to the east for the still expanding settlement Ma’ale Adumim. The Wall will amount to the confiscation of 90% of the land in the Jerusalem district. Breaking down the problem By breaking down the problem to its separate components, the following components are revealed: • Palestine • Israel • Entire population • The wall • Pain • Apartheid • Devastation • Destruction • Mayhem • Confiscation • Human rights • Violations to International Law • Burden • Land • Property • Living • ...etc. By combining the components of the problem, and with the help of a common saying ("...burden on my back"), the main idea is yet to be born: The Wall is a burden on the back of each individual Palestinian! Visualizing the problem (Symbols and signs) A symbol is a visual image that stands for a concept or situation. In our case: • The body symbolizes the people and land. • The (kuffeyeh) symbolizes Palestine. • The reclining of the body with the hand on the back symbolizes pain and suffering. 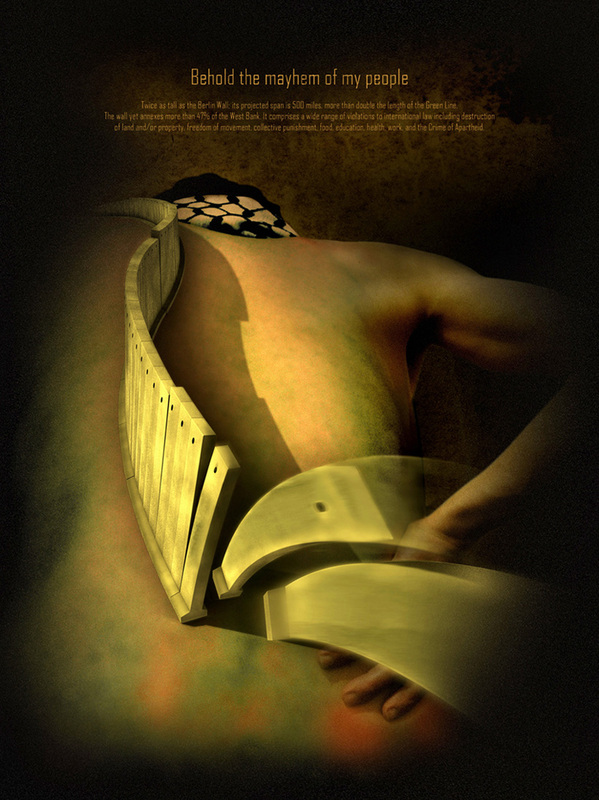 • The wall symbolizes destruction, burden, and mayhem of Israel.